It was only a matter of time before the bat-s*** craziness of my home state extended to . . . bats. And s***. In New Orleans, McDonogh 35 High School's flying-rodent problem has been well known for a while now. In fact, it made the TV news in January (above). 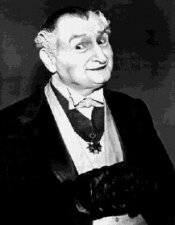 Plans were hatched (none of them, sadly, involving input from Grandpa Munster, who knows bats better than your average ghoul), and Orleans Parish School Board officials spoke earnestly about the school's winged dilemma. On the television, doctors gravely noted that people can, like, catch stuff from being around bats -- and their droppings. Rabies, for one. Of course, this wasn't deemed a problem, and district officials noted that a student was far more likely to die falling through a floor or when a ceiling caved in on him. OK, Orleans school administrators didn't actually say that. It well could be true, but that's because the McDonogh 35's falling-down problem just might be worse than its bat-infestation problem. Anyway, that was last month. Plans hatched. Anti-bat blitz promised. Students thought to be perfectly safe -- just so long as you didn't actually think about it. NOW WE fast-forward to Friday's TV news. It seems students are protesting outside the school and are refusing to go inside. Now, why might that be? Guess. Students at McDonogh 35 High School refused to go to class early Friday morning, saying they are fed up with problems at the school, specifically bats in the building. Students and parents say there have been bats inside the school for months and they've begged the principal to do something about it with no results, so Friday students stood outside the building demanding action. Organized and determined, these high school students said enough's enough. They were teaching the first lesson Friday morning, and it was the right to protest. They say the school building is old and falling apart, and they've been living with that but say now its infested with bats and they can't learn. Parents share the frustration and stood alongside their kids demanding something be done immediately. "The only thing we want to do is protect our children, this right here is our future and if they dont' care about it, we care about it," said Gail Greathouse, a parent. Orleans Parish School Superintendent Darryl Kilbert said bats are common problem in older buildings in blighted neighborhoods. He said they will close the third floor of building, at least through Mardi Gras, to let pest remediation continue. IF YOU'RE shocked, you must not be from Louisiana. What is shocking, though, is that parents and students cared enough to actually raise hell. That may be a first. Obviously, all that flappin', swooping and screeching must have driven them, uh . . . batty.